Noleen Hausler had been suspicious about her father’s bruises but lacked proof to back her complaints that he was being abused in his Adelaide nursing home. Bedridden Clarence Hausler, 89, has end-stage dementia and cannot walk or talk. “I thought I wasn’t being heard and I was suspicious of a certain staff member,” Ms Hausler told 7.30 in an exclusive interview. The tiny spy camera she covertly placed in her father’s private room at the Mitcham Residential Care Facility in Adelaide in September last year recorded disturbing acts of abuse in just two days. In the video, Corey Lyle Lucas, Mr Hausler’s carer employed by the facility, appeared to violently force-feed Mr Hausler with a spoon, sneeze on him, eat Mr Hausler’s food using his cutlery, flick his nose and pin Mr Hausler’s arms down when he resisted. The video also appeared to show Lucas attempting to suffocate Mr Hausler with a large napkin. “I honestly didn’t know what to do at first. I thought about ringing the facility because I was scared for my father’s safety but I thought that I wouldn’t do that and I knew that this was very serious so I went down to the Sturt police station,” Ms Hausler said. The abuse she recorded led to Lucas’ conviction for aggravated assault. Mr Hausler became a resident of Mitcham Residential Care in 2002. The facility was later taken over by a subsidiary of Japara Healthcare, whose website states it is “one of Australia’s largest private sector enterprises in the aged care and retirement industry”. Ms Hausler said the standard of care subsequently declined. 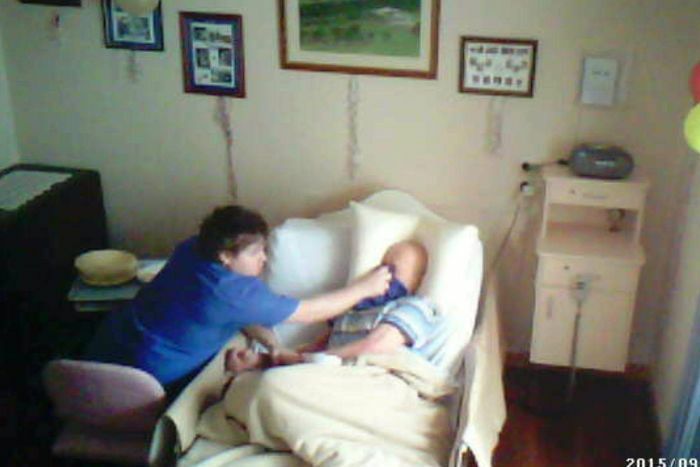 PHOTO: Noleen Hausler hid a video camera in her father’s nursing home room. Soon after, according to Ms Hausler, her father’s behaviour changed. “He became a lot more reserved and protective in his demeanour. If I asked him if he was OK or if there was something wrong, he would look at me and then look away,” Ms Hausler said. Mitcham Residential Care’s response when South Australian Police detectives showed the secret footage to management was to forbid Ms Hausler from any further recordings. “Instead of offering Noleen empathy, they instead sent her a letter to cease and desist from filming, as if she was the problem,” Adair Donaldson, lawyer for the Hauslers, told 7.30. “[Mitcham Residential Care] said that I had breached [the] Privacy Act, the Aged Care Act and Video Surveillance Act,” Ms Hausler said. Mr Donaldson said Ms Hausler was fortunate the evidence she collected was found admissible and that it led to the successful conviction of Lucas. “What Noleen did, is it legal or is it illegal? I am not sure, I think the jury is out on that,” Mr Donaldson said. 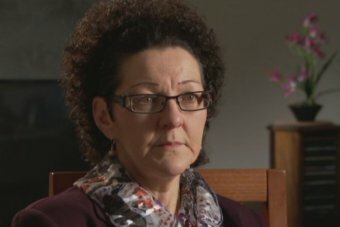 “I was prepared to go to jail for whatever I did and if I’d breached whatever [Mitcham Residential Care] said I’d breached, I would be responsible for all that,” Ms Hausler said. A Mitcham Residential Care spokesperson said in a statement they were “shocked, concerned and saddened to learn of the incident in September 2015”. “This was a rogue act by someone who has now been criminally prosecuted,” the spokesperson said. However, Lucas’ employment was not terminated. He resigned. Mitcham Residential Care also denied any record or knowledge of Ms Hausler’s complaints over Lucas prior to the incident. 7.30 contacted Lucas but he did not respond. Ms Hausler and the aged care advocates who had been providing her with support were now calling for greater transparency in aged care facilities, particularly the use of safety cameras to ensure the proper care of vulnerable and uncommunicative aged care residents. Carolanne Barkla, from Aged Rights Advocacy Service Inc (ARAS), said there was often a power imbalance between aged care clients and the management of their residency. “Fifty per cent of all older people in residential aged care currently have a diagnosis of dementia like Mr Hausler. It is really important to understand that this is likely to increase,” Ms Barkla told 7.30. Mitcham Residential Care, like many other aged care facilities, has its own CCTV in public areas but forbids any other cameras in the private rooms of its residents. “While we have cameras in common areas in our homes, we don’t have any plans to introduce them into residents’ private bedrooms and bathrooms,” a spokesperson said. 7.30 understands that the Australian Aged Care Complaints Commissioner is currently reviewing the initial report that was conducted into Mr Hausler’s abuse. Mr Hausler remains in the same facility due to his advanced condition and Ms Hausler continues to visit him daily, despite the abuse that occurred. “Oh it’s very uneasy. Very uneasy,” she said.